“Malloy said that, in part, his rationale for waiting to make his re-election effort official was to avoid distractions during his recent successful effort to get the General Assembly to enact legislation to raise the minimum wage to $10.10 an hour. "’I didn't want to politicize that issue unduly,’ Malloy said. ‘I talked to Lt. Gov. Nancy Wyman several times about when is the right time to start the campaign, and this seemed like the right time.’"
Mr. Malloy’s official Stamford announcement gave Mr. Malloy the opportunity to stop road testing his campaign and launch his vehicle. During his first term as president, Mr. Obama commanded the heights: The presidency and both houses of Congress had fallen to Democrats. Instead of focusing the energies of his office on repairing the collapsed housing market – which would have been a painful ordeal for the progressive president – Mr. Obama reached for the stars and pulled Obamacare out of his hat. He also engaged in corporate cronyism on a massive scale and managed to pull off a win against moderate Republican Mitt Romney by capturing the “social issues” battleground from which Republicans had retreated with their tails between their legs. Mr. Malloy’s campaign strategy may be deduced from the remarks he made in Stamford. The Malloy program no doubt has been laboratory tested by one of the many strategy groups in the business of winning campaigns. Global Strategy, whose Vice President Roy Occhiogrosso continued to speak in news reports in favor of Mr. Malloy long after he had disassociated himself from the Malloy administration, likely will play some behind the curtain role in Mr. Malloy’s re-election effort. 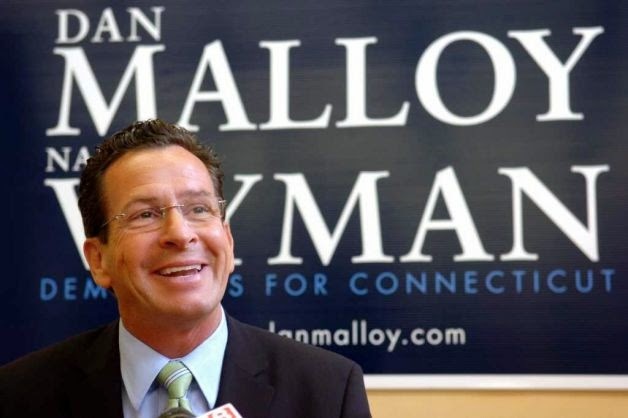 But as governor of a northeast progressive state, Mr. Malloy will be able to draw upon a vast reservoir of political magicians, some tied by progressive political umbilical cords to the Obama administration, many of which are not formally associated with political parties. In Stamford, Mr. Malloy said that Connecticut’s economy was on the mend, largely owing to his programs. Connecticut’s pre-Malloy “$3.6 billion deficit, the greatest deficit in the nation on a per-capita basis," has been liquidated. In fact, the deficit has been resilient to Mr. Malloy’s ministrations. Connecticut’s non-partisan Office of Fiscal Analysis (OFA) and the Governor's budget office, the Office of Policy and Management (OPM), have both projected a deficit of about $1 billion in the next 2016 biennial budget. Mr. Malloy reduced a major portion of his “inherited deficit” through the imposition of the largest tax increase in state history, a $1.5 billion tax on entrepreneurs and business people who might have used the dollars appropriated by a Democratic Governor and a Democratic dominated General Assembly to invigorate Connecticut’s painfully slow, nearly jobless recovery. Mr. Malloy’s tax increase was not mentioned during his re-election stump speech in Stamford, which is on a par with offering a history of the Elizabethan period in Britain that does not mention Queen Elizabeth. Neither did Mr. Malloy mention that Republican Governors Jodi Rell and John Rowland did not have at their command a Republican dominated General Assembly. Although it is the legislature that shapes and affirms budgets presented to it by the executive office, Mr. Malloy was content in his Stamford re-election announcement to lay at Mrs. Rell’s feet the debt he inherited. Mrs. Rell is likely to play in Mr. Malloy’s coming campaign the same opéra bouff role played by outgoing President George Bush in Mr. Obama’s first – and second – presidential campaigns. Under former Gov. M. Jodi Rell’s administration, Connecticut was the first state to expand that portion of Medicaid, which previously had been solely funded by the state. In three years, enrollment in the program has doubled from 45,000 to more than 90,000. The state receives partial reimbursement now from the federal government for the program.